Script by Alan Moore, art by Kevin O'Neill with Ben Dimagmaliw. All material presented here is ©Alan Moore and Kevin O'Neill. For a complete list of all books reviewed in this blog, please visit the index page. 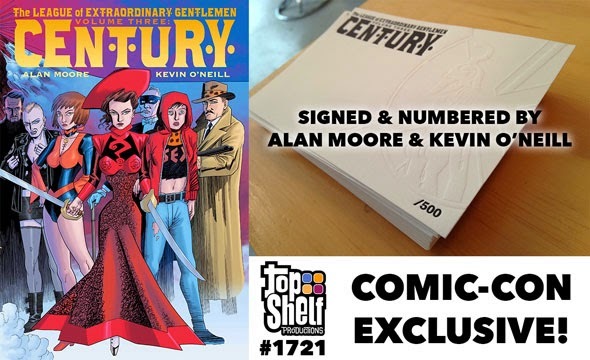 This hardcover collected edition of century (7 x 10.5 inches or 18 x 27 cm, 256 pages) designed by Todd Klein, was co-published in June 2014 by Top Shelf (ISBN: 978-1-60309-329-3, cover price $29.95) and Knockabout Comics (ISBN: 978-0-86166-232-6, cover price £19.99). It comes with a fully illustrated dust jacket (see pictures above and below) and, as I have bought the 2014 San Diego comic con version, it features a signed and numbered embossed bookplate (mine is #376). Note that this bookplate was inserted in the regular book but the later was sold 50$ at the July SDCC convention. I will try to pinpoint exhaustively all the new exclusive illustrations done especially for this edition by Kevin O'Neill, starting with dust jacket cover and flaps, and the beautifully painted second and third of covers. The third picture below is for size comparison with the regular third issue of the series (Century #3: 2009), and the oversized Delcourt French edition for Century #1:1910. The inner book displays a black embossed canvas hardcover (there is no design on the back cover). Every B&W third of cover of original issues ending Minions of The Moon are published here in colourised form. This edition doesn't included second of cover (vintage advert page), credits page as well as opening "helmeted Lady with a trident (LOEG associated symbol)" opening page from 1969 and 2009. I have been lucky enough to put my hands on the Gosh! limited signed and numbered (out of 1000, respectively #820, 8 and 954) bookplates. Hello, first of all cool site :) I'm also wondering if you know if this LOEG volume 3 was ever released in the Absolute format? I know the first two were and same for Black Dossier, but I can't find any information about volume 3 in the Absolute format. Thanks in advance!